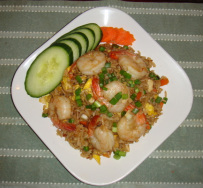 One of Thailand famous dishes, Stir-fry rice with egg, onions , peas, carrots and scallions. 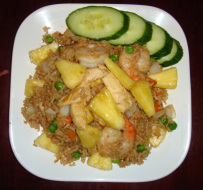 Stir-fry rice with egg, pineapple, onions, peas, carrots and raisin with lightly curry powder. 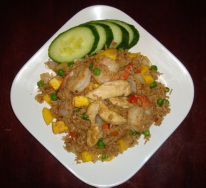 Stir-fry rice with egg, mango, onions, peas, carrots and raisin with lightly curry powder.